THE DREAM IS NEARLY A REALITY. THE exterior is complete and a promise of the beauty and luxury that awaits inside. The landscaping is in place, brush has been cleared to enhance the water view and the ancient moss-draped oaks frame the amazing new structure. Where once a pink brick bungalow stood is now an impressive two-story gray home that blends the new with the best of the old. 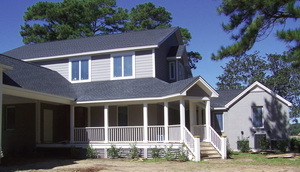 Wide porches invite you to sit awhile and enjoy the fresh breeze. Inside, the personality of the house shines through. The great room, with its grand fireplace, soars to new heights, and, when you look up, the ceiling features beautiful beams. The downstairs also includes three large bedrooms, which are parts of the original house. A transom over one door has been preserved. Another room has its own deck with serene views. But it is the kitchen that draws my attention. 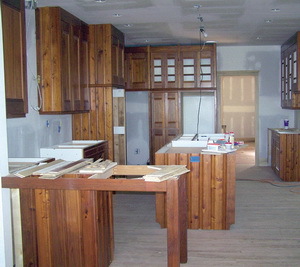 Now I can see the layout, and it is designed to be a gathering room as well as a place to prepare meals. The best part is the cabinets. Reclaimed from the former house, they are rich in color and architectural detail. An extra touch is the built-in desk with shelves against one wall. It is the perfect spot for cookbooks and, perhaps, a computer. It could almost make taking care of household expenses a pleasure. Upstairs, one section is a spacious loft over-looking the great room that could be an office, a sitting room or a media room. Though it is open, it offers an air of privacy and serves as an extension of the master suite. The master bedroom is all anyone could want. It is bright and airy, affording wonderful views of the river. A balcony invites you to sit and enjoy breakfast amid the placid surroundings. And the master bath is nothing short of fabulous-it includes a circular shower, dual vanities and two large closets. The entire area is as big as some bedrooms in more ordinary homes. I-m excited but a little sad to see the house nearing completion, because what I-ve come to think of as "my" house will soon belong to someone else. That someone will appreciate the love and attention that is built into every corner, enjoy the whisper of the wind on the porch and turn the house into a home. Would you like this content on your website or do you have any questions about this article? If so, contact publisher@mediaservices1.com.